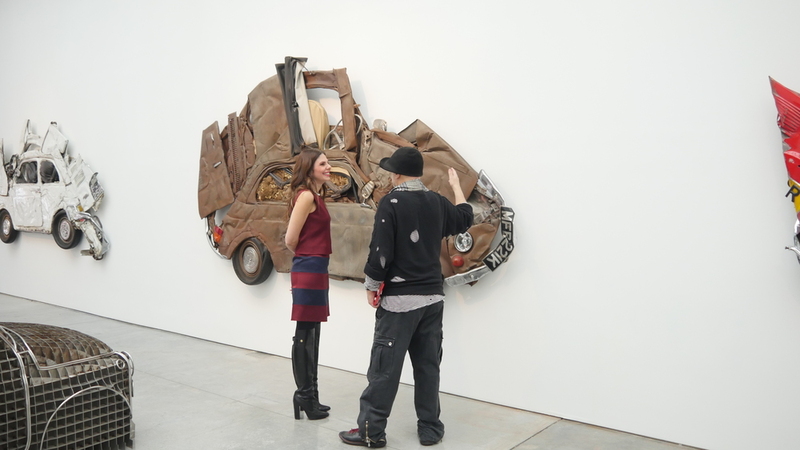 Ron Arad and I at Paul Kasmin Gallery in his exhibition "In Reverse". All photos by Peter Koloff. A heated topic of the last couple of years has been that which brings to the surface the dichotomy of where the line of art and design merges and how we are finding an increasing group of fearless artists/designers who are willing to explore both sides of the equation regardless of what the establishment says. Considered by many as one of the most influential artists of the 21st century, Ron Arad is a perfect –and unapologetic- example of that. 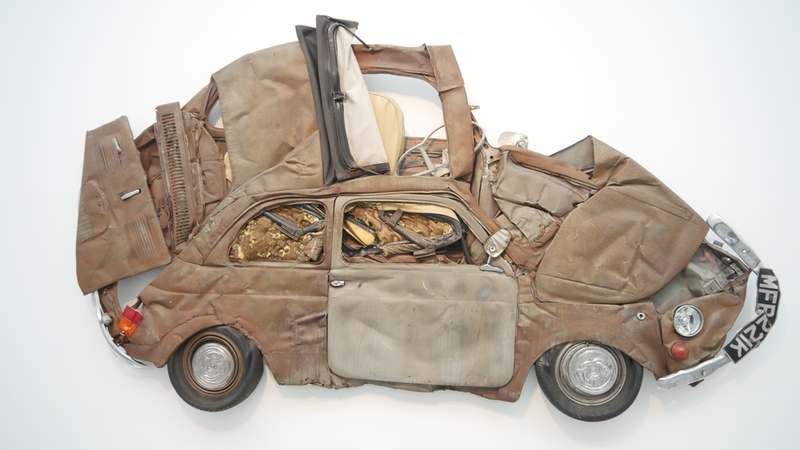 Always creating controversy, sparking conversation or simply being provocative, Arad’s first solo show at Paul Kasmin Gallery, titled “In Reverse” shows six different Fiat 500 cars that have been crushed to the point of making them flat. What started as a failed commissioned project where Ron had to get his pieces back and crush them, turned itself into a fascinating endeavor. Having always been known for his sculptural work most of which has a certain height, weight and overall volume, he started to toy with the idea of creating flat pieces. And then the Fiat 500 came as a reference: the car that his father was driving when a near-fatal accident almost killed him and the car that Arad himself has driven for years. 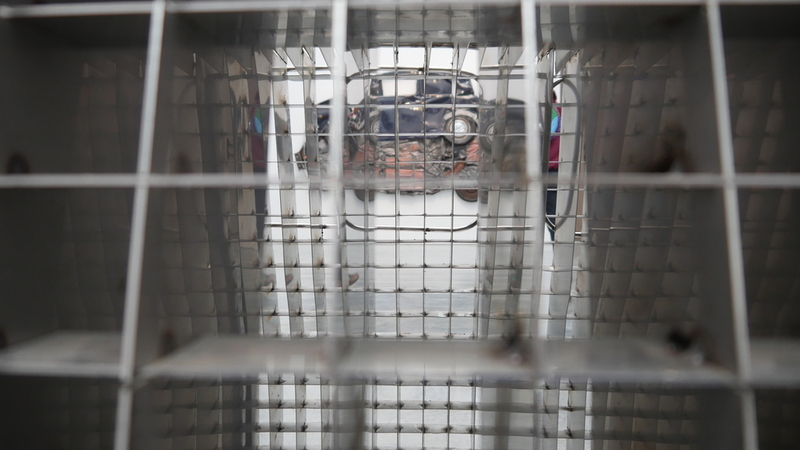 “I like the idea of turning a three-dimensional object into a bi-dimensional one” he says cheekily - adding that, this is really the reverse of design rules: he turned a functional car, into a piece of art that has no utilitarian value. 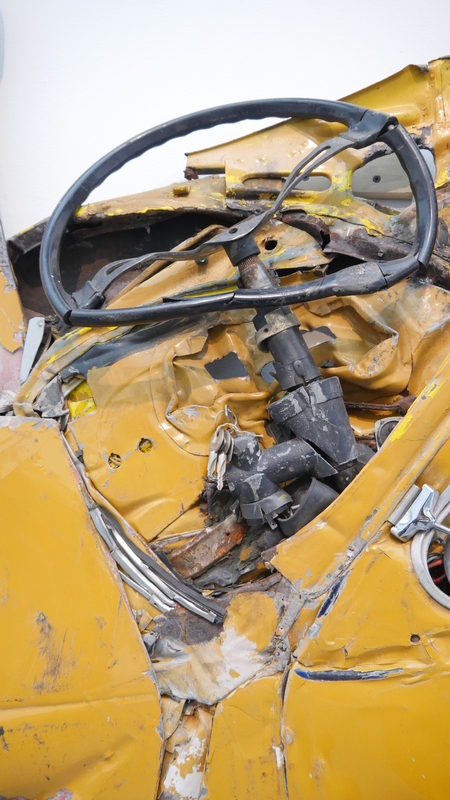 The cars ranging from yellow, blue and red are called “Pressed Flowers” because that is what they look like – and in the process Arad is immortalizing the iconic Fiat model as well. Ron not only walked me through the exhibition but also played videos on his iPad that allowed me to understand all the hurdles that he and his team had to go through: from trying methods that included cranes to tractors to having to move the compressing part of the project from Italy to the Netherlands. The fascinating mind of Arad conceived another piece strategically positioned in the middle of the gallery and called “Blame the Tools”. 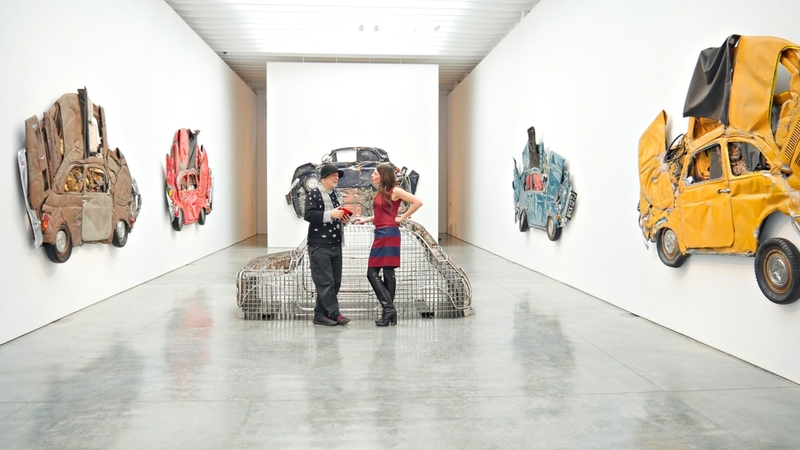 Arad told me that the sculpture was an afterthought that came to him during the process of creating the compressed cars. After seeing a gorgeous wood buck that was handmade in the 1950s and used as a model for the original Fiat 500, he decided to do his own version using polished steel rods and bronze (Arad, by the way, means Bronze in Hebrew). Then, “Blame the Tools” was made: a to-scale, digitally grided 3D model of the rod version that is less glossy but not less intriguing. The technological part plays a major role too as Ron created several renderings and eventually hired Framestore (the company that created the effects for the movie Gravity) to produce a video showing a computerized recreation of precisely what happens when the car is getting crushed from the side. The video will be a part of the show as well. When asked what he thinks about the lines between art and design, Arad told me that there’s no such line. And that once he was asked that question in a panel at a conference and when it was his turn to answer, he said that the discussion should have ended a while ago, because there wasn’t a line, not even a blurred one. Therefore the topic, for him, is non-existent. And that was the answer that I should have expected from such a genius man and the one that encapsulates so much of who he is.